At the bottom of most pages on GOV.UK, we ask ‘Is there anything wrong with this page?’. We collect the responses anonymously, in our Feedback explorer tool, sometimes called Feedex. These responses help content designers and publishers fix what’s wrong and collect data on where people are having problems. But the tool is pretty basic. During the pre-election period we spoke to content designers about how to improve Feedback explorer, and watched them using it. The improvements we came up with are now live. 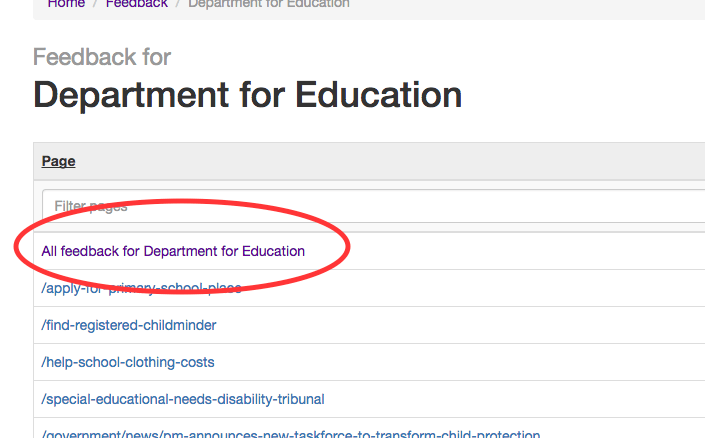 If you publish on GOV.UK, you should have access to the Feedback explorer. If you don’t, raise a support request and we’ll give you access. If you don’t publish on GOV.UK and would like access, have your GOV.UK lead raise a support request. If you search feedback by URL, you will get an exportable list of all comments on that page. This can help, particularly on popular pages. For example, Renew your vehicle tax gets about 60 comments a week. Some are spam, but many of these comments flag phone numbers that don’t work and information users can’t find. You can get all feedback across multi-page content by using just the first part of the URL. For example, www.gov.uk/check-uk-visa will give you feedback on all pages for the smart answer. And www.gov.uk/child-tax-credit will give you feedback on all pages in the guide. We’ve added the ability to filter feedback by organisation. Search by an organisation then click through the ‘All feedback for (your organisation)’ link to download. From there, you can export all your comments as a CSV file, or filter by date and then export. If you open the CSV file from Excel, or any other spreadsheet programme, you’ll see further information on what type of browsers people were using. You can also then sort and work with your feedback in a spreadsheet. We know many of you want to see only Whitehall content for your organisation. We haven’t built this yet, but we have a hack. If you are on the screen above, you can add &path=/government to the end of the URL in your browser, and it will filter the results. Be aware that this hack doesn’t include feedback for detailed guides. If you look at feedback on the ‘done’ page of a service the comments will look a bit different. That’s because there's a user satisfaction survey on the last page of the service. If you look up feedback on /done/register-to-vote, you’ll get ratings and feedback from people who have registered to vote on GOV.UK. You can filter by time periods before you export, to run monthly or weekly reports. You'll find that the CSV export puts all the data (rating, comment, browser details) in separate columns, to make it easier to sort, filter and pivot. You can see just the submissions with comments by filtering out the empty feedback column in the spreadsheet. The 'done' pages export sometimes includes standard feedback from ‘Is there anything wrong with this page’. You can exclude this information in the spreadsheet by using the 'type' column (the last column in the spreadsheet). We’re also looking at ways to improve the quality and quantity of the feedback we collect. We tested a new structure for the feedback form on some popular pages, and we’re analysing the results now. We'll blog about it as soon as we have the findings. Before we made any changes to the explorer, we learned how publishers would like the tool to work. These improvements were what we could build in the time we had for this improvement theme. When we make further improvements to the feedback explorer, we'll add more columns to the CSV export (eg the publishing tool, content format). That way you'll be able to slice and filter the feedback in more ways, to get only what’s relevant to you. We'll also look into adding notes on the feedback, to let others in your department know when something's been fixed. Jake Benilov is a developer on GOV.UK. Keep in touch: follow Jake on Twitter and subscribe to email alerts from this blog. But surely this anonymous feedback cannot be acted on without reference to the 'named contact' feedback, from customers using the contact form? Are there any plans to bring that data into Feedex (minus the contact details presumably) to make it a one-stop-shop for customer comments on our content? Hi James, thanks for the feedback. - Feedex assumes that feedback is tied to specific pages and URLs. By contrast, named tickets are very rarely tied to any specific page and often cover several topics – Feedex would require significant changes before it could support categorising and finding appropriate named tickets. Naturally, that doesn't mean that named tickets should be ignored when designing content – they should be combined with anonymous feedback, analytics and call centre data to build the full picture. It's just Feedex will require major changes before it's capable of handling that information. Very often reported errors are marked as solved or closed when in fact they have simply been passed on elsewhere - even when the errors are not content related. It is often a very long time before corrections are made, if at all (in some circumstances it may be that the relevant department thinks I'm wrong, and in some circumstances they may be right). This difficulty results in users making informal connections with staff in responsible departments. Not a bad thing in itself, but likely to distort overall perceptions. It would be great if each page on .GOV.UK was marked up with some indication as to where the content was generated (GDS or department(s)), and where responsibility lies. Do you analyze the feedback data to identify issues and recommend/work on the improvements? If so, how do you analyze the comments and report on them? Does every department do their own reporting, or is there an overall high-level analysis for Gov.uk as a whole? The feedback data is used in a variety of ways; the Government Digital Service GOV.UK product and content teams combine the feedback with other data (like analytics, call centre data, feedback from specialists etc) to make improvements. Outside the teams in GDS, many departmental/agency content designers have access to the feedback and monitor it for emergent problems with GOV.UK information and services. In addition to that, the aggregated statistics about feedback volumes are tracked so that spikes or unexpected faults can be found. Thanks for your reply! It's great that you combine the online feedback with other data. Just so I understand clearly, does this mean that you only analyze the trends and themes in the online feedback if you notice spikes? Otherwise, it's the department content designers that monitor the issues on the pages they own?